Cleopatra Needle, Part 1 can be found here. 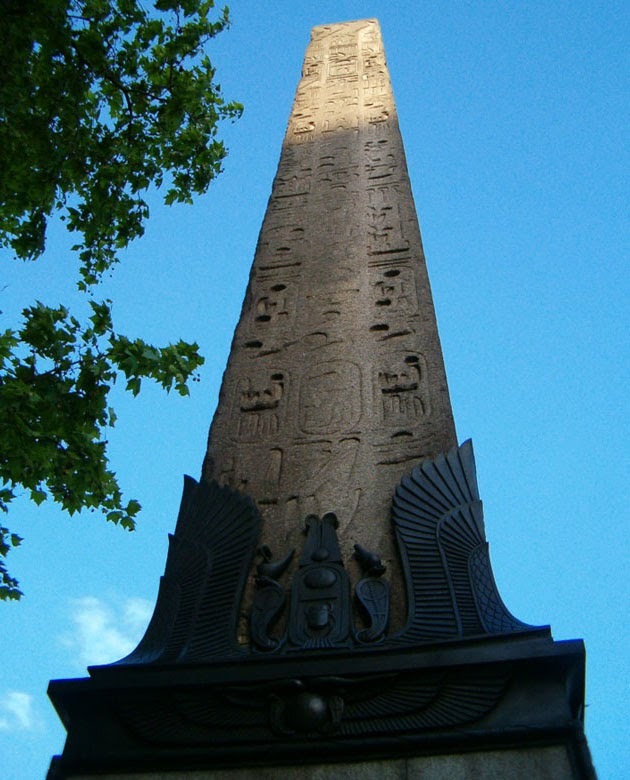 Cleopatra's Needle is the popular name for each of three ancient Egyptian obelisks re-erected in London, Paris, and New York City. Cleopatra’s Needle in New York is the oldest man-made object in Central Park. The obelisk is more than 3000 years old and was commissioned by Pharaoh Thutmosis III around 1450 BC in celebration of the 30th year of his reign. 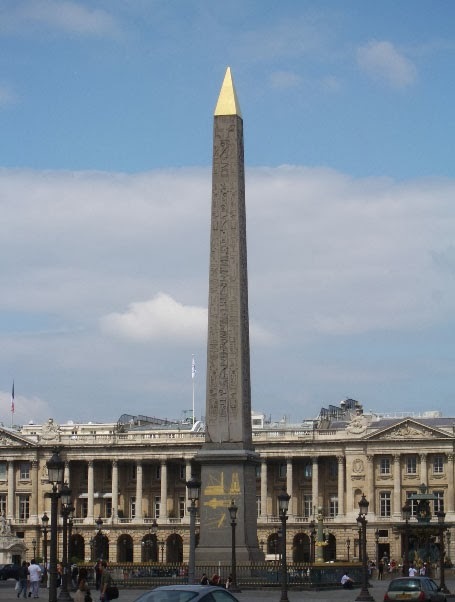 In the 18th century during the Enlightenment, the obelisk began to symbolize eternity and it became a popular form of commemoration for victories and heroes by the Europeans. 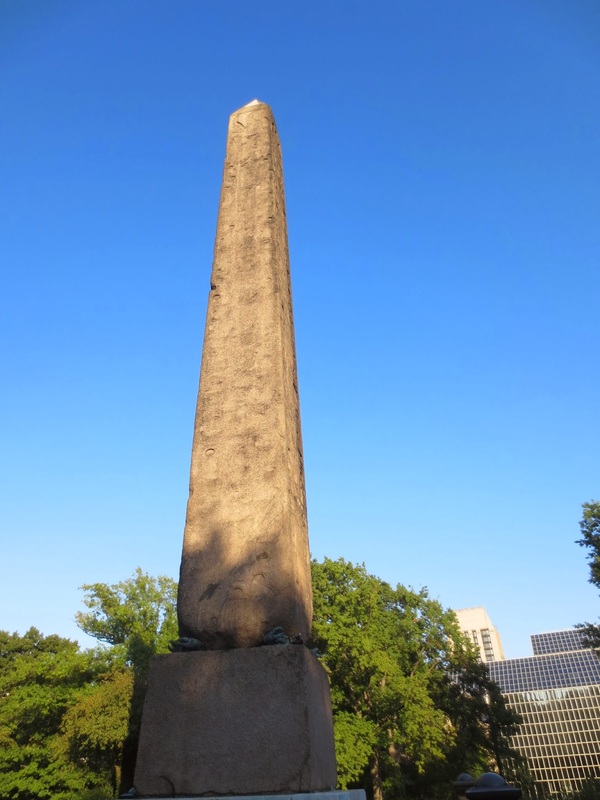 New York's Obelisk, the second of Cleopatra's Needles, was the third obelisk to leave Egypt in the 1800s. The first one, the twin of New York obelisk, was presented to Britain by Egypt's leader Muhammad Ali in 1819. The UK obelisk waited in Alexandria until it was shipped over in 1877. En route to England, a storm break out and six crewmen were killed attempting to rescue the sinking obelisk. Cleopatra’s Needle was erected on the Victoria Embankment of the River Thames. Buried beneath is a time capsule with an odd assortment of Victoriana – tobacco pipes, children's toys. a razor, a portrait of Queen Victoria, photographs of English women and a map of London. Muhammad Ali,pasha of Egypt after 1805, presented France with its Luxor obelisk in 1826. The obelisk was moved to France in 1833. King Louis Philippe re-erected it in the Place de la Concorde in the center of Paris, where the guillotine had sat. It was meant to serve as a monument to memorialize King Louis XV and those who lost their lives during the French Revolution. 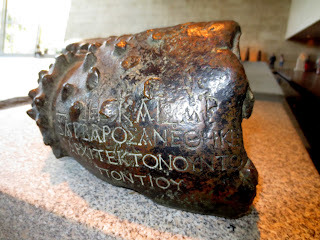 The original cap of the obelisk is missed ( believed to be stolen in the 6th century BC). In 1998 the government of France added a gold-leafed pyramid cap to the top of the obelisk. In 1869, to commemorate the opening of the Suez Canal, the Khedive of Egypt, Ismail Pasha, gave the United States the twin of the London Cleopatra's Needle. It was a difficult task to transfer 71-foot, 244- ton granite monument from Egypt to New York. The project was funded by William H. Vanderbilt, at the cost of $102,576. 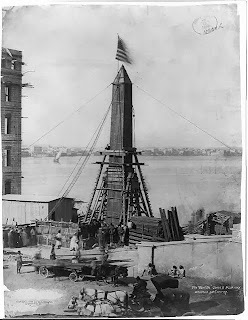 On July 20, 1880, the obelisk arrived and the ship anchored off Staten Island. 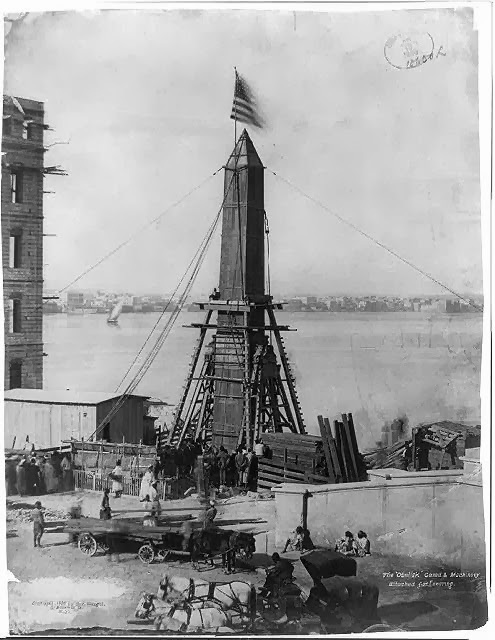 The obelisk was floated up the Hudson River to 96th Street--the only spot in the riverbank that wasn't too high for landing. The special track was built to transport the obelisk on land to Central Park. It took thirty-two horses hitched in sixteen pairs to pull the obelisk to the park. It was erected in an official ceremony on January 22, 1881. There a time capsule buried beneath the Obelisk in New York,as it was done in London. It includes an 1870 U.S. census, the Bible, Webster’s Dictionary, the complete works of Shakespeare, a guide to Egypt, facsimile of the Declaration of Independence and Masonic emblems. When the Romans transported the obelisk to Alexandria, the base was damaged and four crabs were added for support. Only two of these original crabs remain- you can see them in the Metropolitan Museum Of Art. 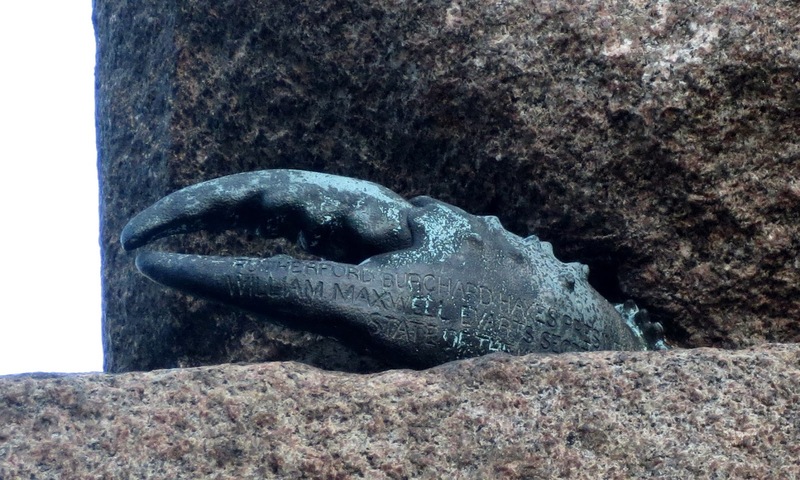 One of the claws has an inscription in Latin on the inside and one in Greek on the outside. Four replacement claws were cast at the Brooklyn Navy Yard. In 1989, the Central Park Conservancy restored the Obelisk’s terrace and landscape with new illumination, benches and paving. The landscape is particularly beautiful in spring when the monument is surrounded by flowering magnolias and crab apple trees. Although its hieroglyphs on the surface of the obelisk survived three thousand years’ exposure to the Egyptian air, they have virtually disappeared after 130 years in New York. But Egypt is not safe even for the art and historical objects. Egypt’s famous Malawi National Museum has been ransacked, looted and smashed up by vandals in August 2013. As I can find there are plans to clean and restore the historic monument. The exhibition 'Cleopatra's Needle' in Metropolitan Museum from (December 3, 2013–June 8, 2014) will celebrate the Central Park Conservancy's upcoming conservation on the obelisk. 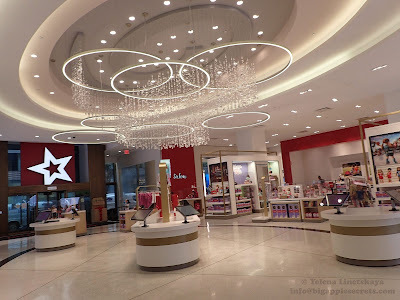 Bloomingdale's. The windows of the world. A horse-drawn carriage, Bloomberg and de Blasio.